This is my first year participating in MOPS (Mothers of Preschoolers) and our theme is "Be You Bravely". We meet two Tuesdays a month to fellowship kid free, EAT kid free, and listen to speakers who share their life experiences. I have really enjoyed making new friendships with other women who are in the same stage of life as me (and eating kid free, lol). I was excited to get to read and review Brave Mom because it goes along with our MOPS theme, being written by the President and CEO of MOPS International- Sherry Surratt. The book is relateable and very easy to read. She addresses top fears moms worry and stress over and what we can do besides said worrying and stressing. She focuses on taking precautions to minimize risk and then focusing on the positive instead of fretting over situations we have no control over. I like how each chapter ends with questions that make you think about how you can apply what you've learned. 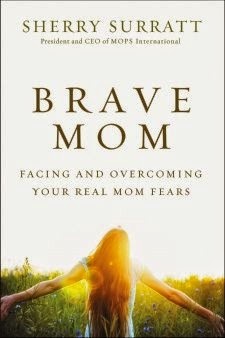 Overall, it's a great read---not too deep, but makes you feel like you aren't alone or crazy and gives practical advice for overcoming your real mom fears.